Godzilla was a 300-foot tall, fire-breathing lizard, mutated by Man’s folly of repeated atomic experiments. The creature, known as Gojira in Japan, has been around since the 50’s, when Japan’s Toho Studios seemingly cranked out a Godzilla film every month or so. Godzilla vs. Mothra, Godzilla vs. King Kong, Godzilla vs. Frankenstein's Daughter; if it was big, rubbery, and around in the 50’s and 60’s, Godzilla fought it. The movies served as a faint inspiration for this series, which made its debut in 1978. The Power Hour had two separate segments. Godzilla had our giant lizard buddy assisting Captain Carl Majors and his crew—Dr. Quinn Darien, her excitable nephew Pete, and Brock, who was Carl’s first mate. When the team wound up in a scrape, they could summon Godzilla from the ocean floor via a hand-buzzer controlled by Capt. Majors. Along for the ride was Godzooky, Godzilla’s winged nephew, who provided comic relief. 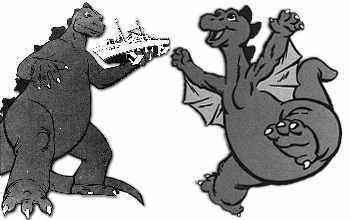 How a radioactively mutated lizard came to have an entire 'Zilla family was never fully explained on the show. The second segment was Jana of the Jungle, which featured Jana, a blonde girl who had been orphaned in South America and raised by Indian chief Montaro. Armed with a magical staff of power and accompanied by Jana’s pet jaguar (Ghost) and coatimundi (Tiko), Jana and Montaro searched for the girl's long-lost father, who had disappeared in the Amazon along with Dr. Ben Cooper. The show lasted two months in this incarnation, stretching to ninety minutes by adding Jonny Quest reruns and changing its name to Godzilla Super 90. In September of '79, the show shrank to one half hour and aired under the title of Godzilla, which was just fine with Godzilla. He'd been a loner his entire career, and didn't need help from anyone, least of all from a kid secret agent or some blonde with a travelling petting zoo. NBC thought otherwise, however, and after a month the Big G was paired up with reruns of The Super Globetrotters under the title of The Godzilla/Globetrotters Adventure Hour. This ran the rest of the '79 season, actually airing two times per Saturday from 4/12/80 to 9/20/80. The show gained new rerun buddies on 9/27/80, and ran as The Godzilla/Dynomutt Hour with the Funky Phantom until sometime in November 1980, when it metamorphosed into The Godzilla/Hong Kong Phooey Hour, which ran until 5/15/81. Godzilla came full circle on 5/23/81, headlining his own half-hour show until finally being cancelled on 9/5/81.